Relatively cheap, high quality Japanese cameras were now appearing in most U.K. camera shops and in response to this the major German manufacturers reduced their prices. Corfield's realised that in order to survive they needed a large injection of capital so that they could improve their existing facilities and produce a camera that could successfully compete with the new competition. Unfortunately in the early 1960's investors were few and far between. Fortunately, Guinness the Irish brewer was looking for investments in Northern Ireland and so Corfields made an approach. 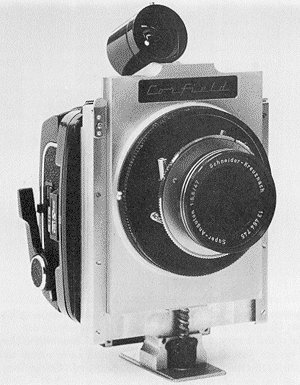 Eventually an agreement with Guinness was reached which would allow Corfields to carry on producing cameras and give them the much needed development costs for a new model. The down side was that Guinness would take a majority shareholding and appoint their own chairman of the Board of Directors, leaving Sir Kenneth as Managing Director. They also required Corfields to produce components for the metal kegs which they had just started to use. Sir Kenneth soon left the company and John was appointed Managing Director. He advised the board that the sum they were prepared to pay for new camera development was insufficient to restore the company's position as a leading camera manufacturer. This was due to the technological and cost-cutting advances that had recently been made by the Japanese and German manufacturers. Sadly the changing competition from abroad now meant that the company could not realistically compete as a camera manufacturer and so a new direction had to be found. John went to America and negotiated a license to manufacture and market the Prestolite range of alternators and voltage regulators for motor vehicles. Taken from a Corfield Prestolite leaflet. 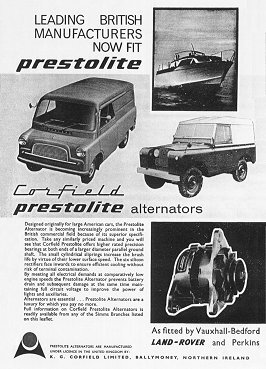 Designed originally for large American cars, the Prestolite alternator is becoming increasingly prominent in the British commercial field because of its superior specification. Take any similarly priced machine and you will see that the Corfield Prestolite offers higher rated precision bearings at both ends of a larger diameter parallel ground shaft. The small cylindrical sliprings increase the brush life by virtue of their lower surface speed. The six silicon rectifiers face inwards to ensure efficient cooling without risk of terminal contamination. By meeting all electrical demands at comparatively low engine speeds, the Prestolite Alternator prevents battery drain and subsequent damage, at the same time maintaining full circuit voltage to improve the power of lights and auxiliaries. Alternators are essential. Prestolite Alternators are a luxury for which you pay no more. Full Information on Corfield Prestolite Alternators is readily available from any of the Simms Branches listed on this leaflet. John continued as Managing Director for another seven years, and finally moved back to England, having accepted the position of CEO with an aircraft components firm that had been losing money and needed turning around. It took him less than a year to achieve this goal and so he moved on to become Managing Director of an American-owned company that made and supplied switchgear throughout Europe. After seventeen years he retired, and now lives in Devon. K. G. Corfield Limited continued for another 3 years, but finally closed in July 1971. At the end of camera production Mr. Stanley Corfield Senior retired for a second time and his son Stan went to Australia for a few years to be with his children. On his return to England he also retired. Sir Kenneth has since had a distinguished career. When he left Northern Ireland he became Executive Director of Parkinson Cowan and in 1967 became Executive Assistant to the President of I.T.T. Europe. He was appointed General Manager of the I.T.T. components group in 1968 and soon became Vice President and Director of I.T.T. Europe. In 1970 he became Managing Director of S.T.C. and in 1974 was elected Deputy Chairman to the Board of S.T.C., and appointed Senior Officer for I.T.T. U.K. He became Chairman and Chief Executive of S.T.C. in 1979. In 1980 he was awarded a Knighthood for his services to export. Few people have had as much of an impact as Sir Kenneth on the British photographic industry. Thankfully he is still involved in this area today. Sir Kenneth never forgot his roots. When he found it impossible to purchase a suitable camera for photographing buildings in a confined space, he decided to make one. The camera is called the Architect. It has a rising front, and uses the 6x7cm format which gives 10 exposures on a 120 roll film. It has an interchangeable back and a 47mm f5.6 Schneider Super Angulon lens which gives a very wide field of view. In true Corfield style this camera is now manufactured. Sir Kenneth has again set up K. G. Corfield Ltd to produce them. Sir Kenneth's involvement in the photographic industry doesn't end there. In the early years of the last century, the Gandolfi family started to make high quality, large format, wood and brass cameras. These were so good that the demand for them has never ceased. A few years ago the last two Gandolfi brothers who ran the business, decided to retire. Sir Kenneth felt very sad that these excellent products would no longer be available. He decided to employ a few people to carry on repairing and building them. Sadly many people have forgotten, or are too young to have heard of the excellent cameras that were made here in Wolverhampton. The people that I have spoken to about this, who do remember Corfields, are still enthusiastic, and fondly remember those wonderful products. I hope that this story will help to put K. G. Corfield Ltd back in the minds of Wolverhampton people, where it belongs.